Medicare’s payment reform, CCM or Chronic Care Management, was first released in January of 2015 and promised reimbursement to practices that could demonstrate 20 minutes of non-face-to-face time spent managing the care of patients with 2 or more chronic diseases. One would think additional new reimbursement, some for work already being performed, would be a welcome opportunity for administrators in ambulatory practices where “the struggle” is beyond real. But that’s not been the case. Frankly, administrators SHOULD be skeptical. After all, it was these good people who nearly bled out with registries, EHR implementations, Meaningful Use, PQRS attestation, ICD9 to ICD10 transition, and along the way many probably had to switch from one bad EHR to another bad one. So, looking at the compliance requirements for CCM and considering a $42 reimbursement per incident, being once bitten twice shy is understandable. But what if you could automate CCM and simultaneously REDUCE the administrative burdens of the practice? Is that possible? It is when you follow these three rules. FOCUS – Better patient health and lower spending are the reasons the CCM program exists. Those must be your goals. You must focus here. CMS makes it clear in the very first sentence of their fact sheet. The Centers for Medicare & Medicaid Services (CMS) recognizes care management as one of the critical components of primary care that contributes to better health and care for individuals, as well as reduced spending. If you have a CCM initiative or are starting one, work backwards from here to stay out of trouble: Better Health. Lower Spending. PATIENT ENGAGEMENT – Ensure your CCM program actively, routinely, and persistently obtains clinical information from the patient and presents it to the staff so they can proactively work with the patient when/if trouble spots appear. Modern platforms make this easier than you think. Patients can update their status with their computers or tablets, or when prompted by their phones. 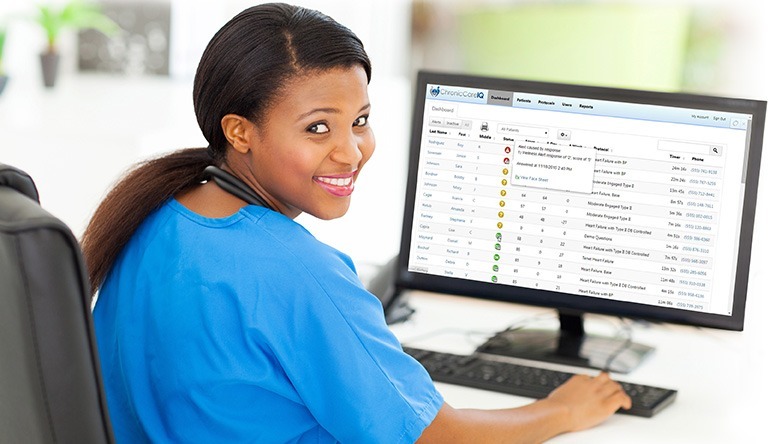 Staff monitor the back-end for concerns or developing trends that may require a nurse or doctors attention. In this manner, the practice becomes pro-active and preventative. You can monitor post-discharge to ensure extended recovery. You can identify poorly trending patients prior to an adverse event like an ED or Hospital Visit. You can modify treatment to prevent disease progression long before the next office visit. However, it all starts with proactive, persistent patient engagement. AUTOMATION – The reimbursement for CCM is $42 per patient, per month. That’s not large enough to warrant much practice attention until it can be done consistently and at scale. Make no mistake, scale is out there. CMS states that 68.6% of all beneficiaries are eligible for this reimbursement and the commercials are now routinely paying too. But, consistency and scale require automation. The good news is that anything that can be reliably duplicated, can be reliably automated. Patients can be engaged. Compliance can be logged and audit details can be tracked. Hundreds of error free, line-item claims for brand new CCM revenue (without having to see patients!) can be seamlessly fed into your EHR for billing at the end of the month. Pages of per-patient audit logs are available on demand in only seconds. However, the relationship you have with your patient can not be automated, which brings us to the final point. When you put real, functional technology behind a problem of patient engagement and task automation, you can better FOCUS on better health and lower spending, while reducing the administrative burdens on the practice. Can you automate CCM and simultaneously REDUCE the administrative burdens of the practice? YES YOU CAN! Unequivocally it is one of the strongest responses we get from new customers. As they enroll their highest needs and most insecure patients, they are quickly astonished at the drop in call volume as those patients begin to report in electronically. Shouldn’t be all that much of a shock, I guess, to learn they don’t really look forward to talking to you that much either! Less time spent on the phone, fewer calls to return, fewer messages to leave and fewer messages to take. Time previously spent on phone tag is re-allocated elsewhere. Patients report feeling more satisfied and secure knowing the practice has an eye on their numbers. They become more participatory in their care. Physicians speak to providing a level of care they call ‘unprecedented.’ And administrators, well…. more revenue and less work certainly doesn’t make the day any harder. We think they deserve it!